The popularity of faux wood shutters is on the increase, possibly due in part to their easy-to-maintain characteristics and their polished, inviting look. And unlike the more inferior shutters of the 1980s, which were made out of vinyl, the faux wood shutters of today are available with more realistic looking wood grains and in a variety of colors and sizes. 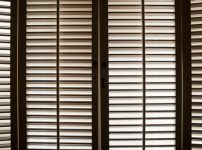 Most people are familiar with common, everyday window shutters. They may have heard stories about how grandma or grandpa grew up with them mounted on the exterior of the windows of their home. Many older farm houses, for example, used exterior shutters to keep out the elements. These days, however, there is a brand of interiorly mounted window shutters on the market that can lower energy costs while providing high energy efficiency and, at the same time, dress up a room. 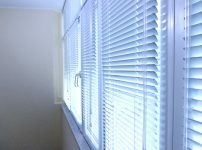 Much like blinds, the slats on shutters can be opened or closed to let in the desired amount of light, or the shutters themselves can be entirely opened for complete natural light and to appreciate that breathtaking view. Where are Faux Wood Shutters Most Commonly Used? With all of the sizes, styles, and colors available, window shutters can be used on a variety of windows and in a multitude of different settings. The color and slat size is customizable. Which color you choose can be decided by whether you want those blinds to be a focal point in the room or recede into the background. A good rule of thumb when it comes to how large the slats on your shutters should be is this: the larger the window, the larger the slats of the shutter should be. Well, shutters aren’t just for windows anymore. Doors are another place that shutters can be utilized, rather than common, everyday window blinds. Do-it-yourselfers, take note: whereas shutters are installed inside the window frame of wall mounted windows when installing shutters on the windows of a door it is recommended that the shutters be mounted on the outside of the window frame. Faux wood shutters are constructed of hollow PVC and can come in a multitude of colors. They are guaranteed not to crack, warp, swell, peel, or fade like real wood can and are fire retardant and easy to clean. These window treatments are suitable for all climates and any number of uses. They fit in most any room. They will never rust and are both moisture and heat resistant. If you are looking for a more casual, cozy, and warm look that you don’t feel can be achieved by curtains, this is an attractive way to dress up your bedroom, home office, family room, and more. Ready to Order Faux Wood Shutters Today? Faux wood shutters can offer the look of wood but also offer flexible options when comes to color and style. Whether you are interested in using them for a new home construction, or you simply want to update your current window treatments, Vogue Window Fashion is here to wow you!